The controversial subject of climate engineering or weather modification – which was popularized, and oversimplified with the term “chemtrails” – is stepping from the shadows and into the light of public scrutiny. What was once a conspiracy theory is now the subject of congressional debate and peer-reviewed studies. This month, a new study published in Environmental Research Letters, normalizes geoengineering and planes spraying particulates into the atmosphere to curb global warming. The study recommends that a fleet of 100 planes make 4,000 worldwide missions per year to “save the world from climate change.” The planes would be spraying sulphate particulates into the lower stratosphere—around 60,000 feet up—to shield the earth from the sun to keep down temperatures. Although controversial, some think that trying to mimic the impacts of a volcano eruption is a viable way to control global warming. This proposed type of climate geoengineering is called stratospheric aerosol injection (SAI). Theoretically if done at scale — and sustained — the impact can be large. The 1-degree temperature drop which accompanied Mount Pinatubo’s eruption is equal to about half of the human-caused warming Earth has experienced since the Industrial Revolution began. “Chemtrails” have long been the talk of conspiracy theories with massive amounts of disinformation being posted all over the internet including fake studies and photos. 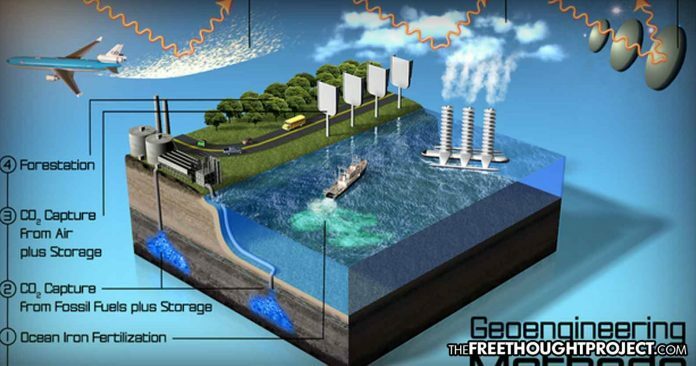 However, it has been proposed that unintentional geoengineering may already be taking place. As Derrick Broze points out, researchers with the National Oceanic and Atmospheric Administration (NOAA) are suggesting contrails from airplanes may be inadvertently geoengineering the skies.